month_to_add : Optional. Number of months to add to the start_date. EOMONTH adds the specified number of months to start_date, and then returns the last day of the month for the resulting date. month_to_add optional parameter can be used to add or subtract a specified number of months from the start_date, and then return the last day of the month from the resulting date. Using EOMONTH function with table data. We will use the following Employees table for this example. The following example returns the last day of the month from the DateOfBirth of every employee. 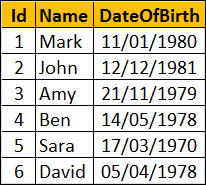 How to find age differ? ?